Thank you to everyone that came out to the Breaking Bread Brunch session in April, and a special thanks to Kyla Farmer and Sarah Beech who facilitated the session — so much rich dialogue and learning came out of the discussion. As we prepare for next Breaking Bread Brunch session, we want to inform you that the date has been changed from May 29th and will now be held on Sunday, June 26 th, 2016 due to some scheduling issues. With the exception of May, we will continue to hold our brunches on the last Sunday of every month. 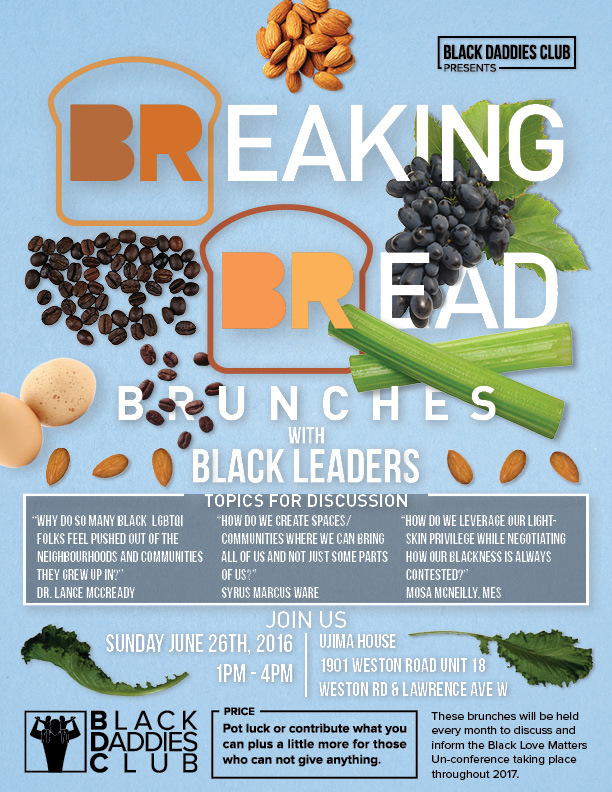 June’s brunch will be talking about “Creating Black Spaces” in our community. The inspiration behind this upcoming session comes from conversations I had with various Black people in our community: whether they are either mixed race and are finding it challenging to navigate Black spaces where they feel comfortable bringing all of their identities to that space; Black LGBTQI folks from our community who share the same sentiments; or myself as a straight, cis-gender Black man with my own challenges when it comes to finding spaces where I feel comfortable being authentic and vulnerable in the way I am able to perform my Black masculinity. Looking forward to seeing you all Ujima House, 1901 Weston Road, Unit 18, on Sunday, June 26th, 2016 from 1pm to 4pm. For those who can’t make it, the session will be available virtually on the Zoom platform (see the links below).